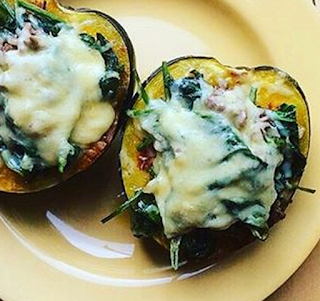 I don't just love Acorn Squash, I'm obsessed with it. If you do too then you'll dig this recipe. If you haven't tried it, you NEED to! It's delishhhh! If you prefer a vegetarian version, just leave out the beef and add any other veggies you choose! I've made this with beans, corn and spinach when I'm out of ground turkey too! 1. Sprinkle halved squashes with the seasoning and bake cut side down at 400 for 30 mins. 2. Meanwhile, brown the beef in a pan (if using) add the onion and spinach and sauté until spinach is wilted. 3. Stuff the squash with the spinach mix and top with grated cheese. Bake again for 10 mins until cheese is melted.